In Windows 8.1 you can change the default launch screen, so you don’t have to start in the (Metro) Modern UI Start Screen anymore. Start your Windows 8.1, login and go to the desktop, rightclick on the Task Bar (The big blue line) and select Properties. 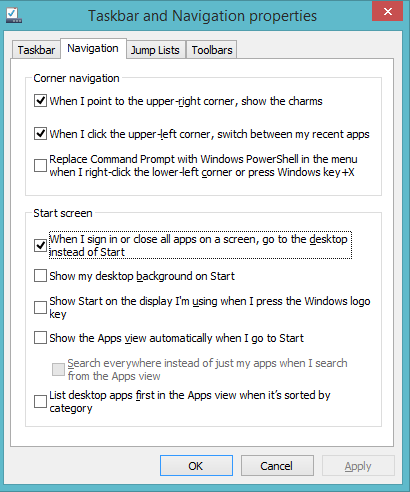 It’ll open the “Taskbar and Navigation properties”, select the Navigation menu. Enable the “When I sign in or close apps on a screen, go to the desktop instead of Start” and press OK.